The source code of this example can be found under "Examples\WindowsFormsExample\" subfolder of the MVC# root folder. The Views part of the Model-View-Presenter triad may be implemented differently for different presentation mechanisms. Each presentation platform (Web forms, Windows forms, WPF) implies its own set of possible views, own rules for views activation and, overall, own presentation specifics. 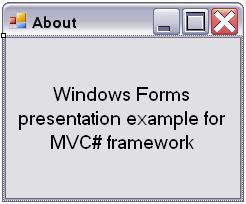 This tutorial covers the .NET Windows Forms presentation facilities in MVC# framework. We will walk through all kinds of views offered by the Windows Forms views engine, and will demonstrate how to use them. The main form for our example application will be an MDI parent form. It will have a menu to select views and a status bar to show the name of the current view. For the main form to act as a view it should implement the IView interface and should be equipped with the [WinformsView] attribute. We could implement the IView interface ourselves, however the framework already provides base implementations to inherit from, thus we would inherit the MainForm class from the WinFormView base class. In the [WinformsView] we have specified "IsMdiParent = true" to make the framework treat that view as an MDI parent. The MainTask mentioned above describes the only task in our application. For the simplicity sake it will allow navigations between any interaction points it declares. This is done by setting the IsCommonTarget named parameter to "true", which makes an interaction point accessible from any other point. As can be seen above besides the main view there will be five more views: two MDI child views, two user control views (inside each MDI child) and an "About" dialog view. MainViewController watches the change of the current view and tells the main view to update the corresponding label in the status bar. 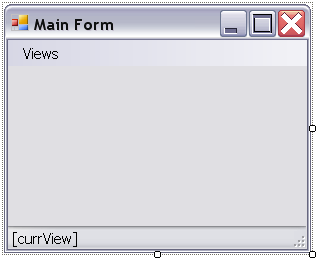 The MainViewController class also handles messages from the main view when a user selects another view in the menu. The CommonController class is empty since the rest part of the application contains only presentation logic. Here we do not list the code for MainViewController and CommonController, as in this tutorial we concern mainly presentation issues, not application logic. Yet you may see this code in the working example project. Now create a new user control class. Make it descend from the WinUserControlView class. 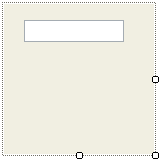 Then place a text box on it in the visual designer. Now compile the project and place an instance of the UserControlView control on the MdiChildView form via the form designer. Also place a text box on the MdiChildView form. When the system (the views manager, to be exact) finds a user control view it retrieves its ViewName property to know which interaction point it corresponds to. That is why we should correctly assign the ViewName property to the user control views. We will do this in the Initialize() method of the MDI child views. If an MDI child has "Mdi Child1" ViewName value then the inner user control view should be named "UserControlView1", for MDI child with the ViewName equal to "Mdi Child2" the inner user control view should be named "UserControlView2". 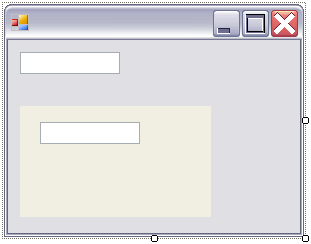 We have shown how to use the Windows Forms presentation mechanism in MVC# applications. Different kinds of views and their features were covered for you to make the best of the Windows Forms views engine within the MVC# framework.